Mt Ritter and Banner Peak, with Thousand Island Lake. Spectacular! Woke up early–4:30ish–to see Orion just clearingthe horizon. Reminded me that the seasons are changing. They could change fast up here in the mountains, though there are still plenty of springtime wildflowers everywhere. Mountains and water everywhere. I am captivated. Got on the trail at about 8:00 AM. Glorious sunrise at the edge of the World. I felt great! The pack weight was easy, and for the first part of the day there was lots of elevation loss. When we had uphills, I really felt it in my calves and glutes. I have an occasional twinge in my left knee. A reminder that the privilege of being able to do this hike could be revoked at any moment by any part of my body. Here’s hoping the occasional pain doesn’t develop into anything major. Betty is feeling better in the altitude. Yesterday at lunch I ate some salmon which tasted good at the time but didn’t set well with me. I kept thinking of Death visiting the dinner party in “The Life of Brian”– “It was the salmon mousse!” I didn’t die, though. As you see. The next pass, Island Pass (10,200′), was also unmarked, and we never did find exactly where the highest point on the trail was. It was a beautiful, open area, full of tarns and little lakes surrounded by stunted and picturesque lodgepole pines, the songs of robins and juncos, my first sighting on the trail of an American Dipper (aka “water ouzel.” I wish they hadn’t changed the name…), and very busy and vocal Clark’s nutcrackers everywhere. The landscape reminded me of the glacier-scraped highlands of Norway. Thousand Island Lake. Imagine having lunch sitting along the shore on the left side of this photo. That’s where we were. 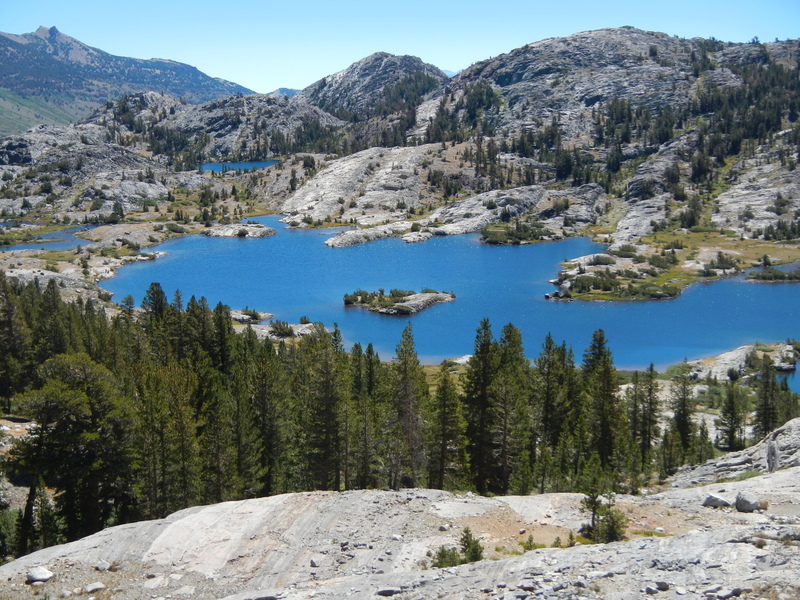 From there, we descended to Thousand Island Lake, where we stopped for a good long lunch. What are our lunch options? Well, generally there’s a choice of hummus, reconstituted refried beans, almond butter or hazelnut and chocolate spread (like Nutella but organic and extra delicious) and a substrate of either crackers or a tortilla. I never got tired of lunch, and generally eat almond butter. Betty said she considers this to be “famine food,” and would rather eat anything else. Glad she brought it for me! She goes for tortillas, I go for crackers. For the beans and/or hummus, there are a variety of hot sauces and spices to add, to change it up from day-to-day. Then it was onward to the Gem Lakes. After a lovely dip in Ruby Lake (total immersion for both Betty and me), I started up the trail before Betty. THEN THINGS STARTED TO GO WRONG. A man had stopped to chat for a moment, saying he was going to Red’s Meadow (same as us) tomorrow. 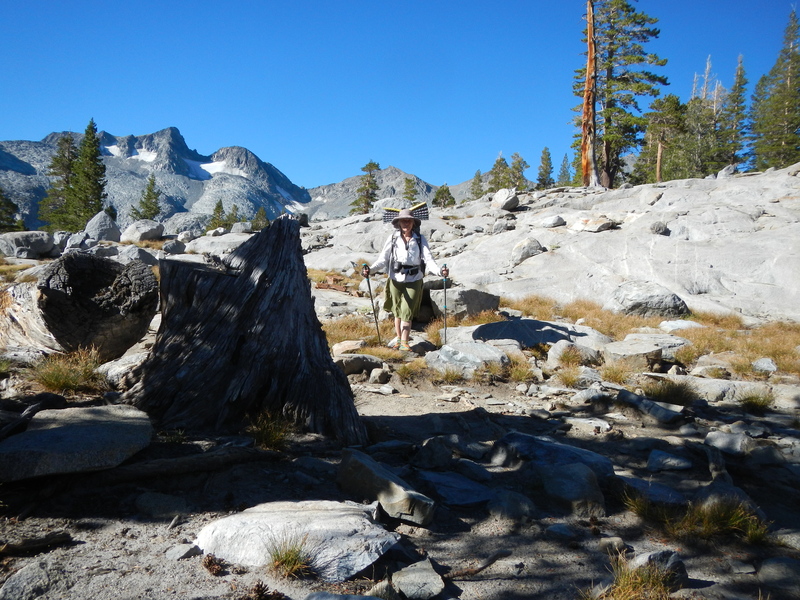 I caught up with him right before Garnet Lake, where there was a trail junction. He said, “The trail goes this way,” pointing to the right. It looked right on the map, except that I hadn’t noticed that the scale was waaaay huger than I thought. 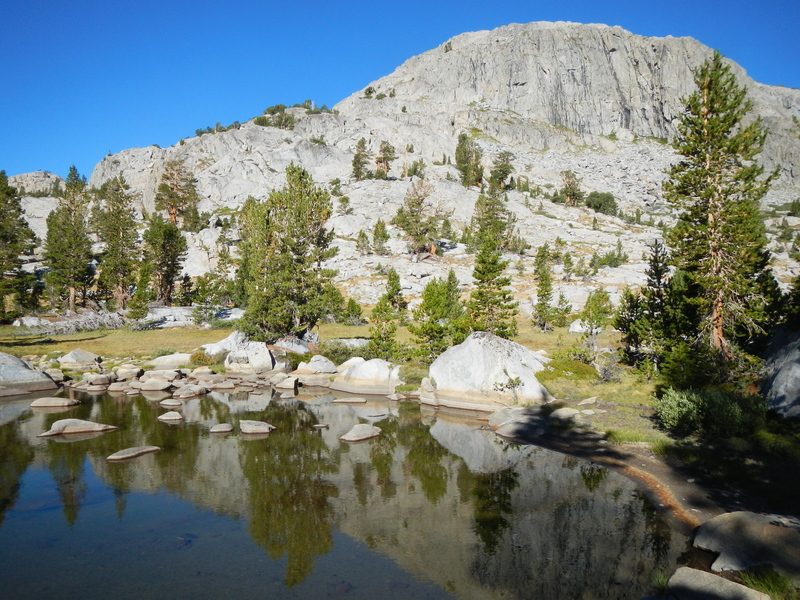 I followed him down to the lake and as we walked he revealed that he’d been hiking with his brother, but 3 or 4 miles out of Tuolumne Meadows, his brother had had to turn back because he was in a lot of pain. Kidney stones were suspected. So the brother was supposed to have caught a bus from Yosemite to Mammoth, go to the hospital and get checked out, and then meet up again at Red’s Meadow to (hopefully) continue the hike. It was an engrossing story, and obviously the lone brother on the trail was concerned and distracted, having had no way to hear from his brother for days. I figured I’d take another dip while I waited for Betty. 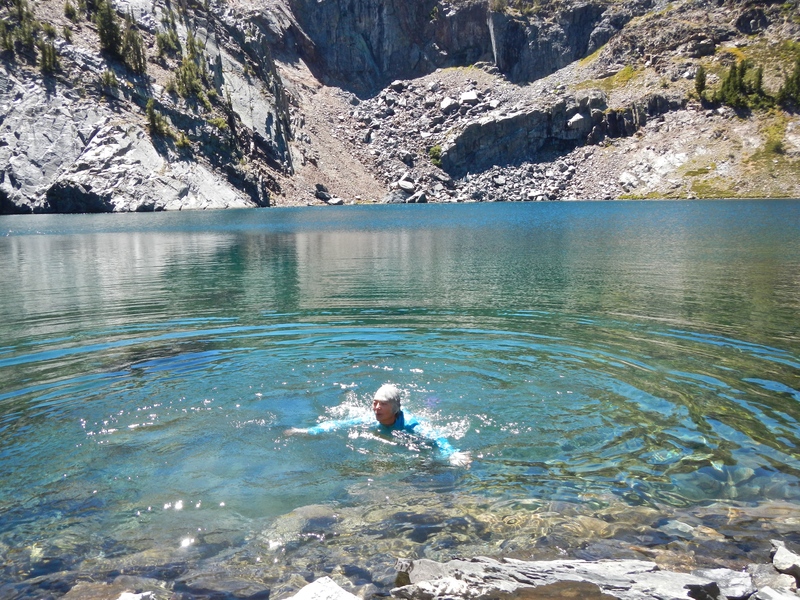 The temperature of Garnet Lake was perfect for a restorative swim, and I swam out to a little island. By the time I got back to the shore, Betty still hadn’t shown up. I started imagining various scenarios, none of them good: she walked off a cliff, sprained her ankle, was waiting with a broken leg to get airlifted out. I was about to run back up the trail, leaving my backpack behind, when I thought that I had better ask some hikers who had just arrived at the lake if they had seen her. 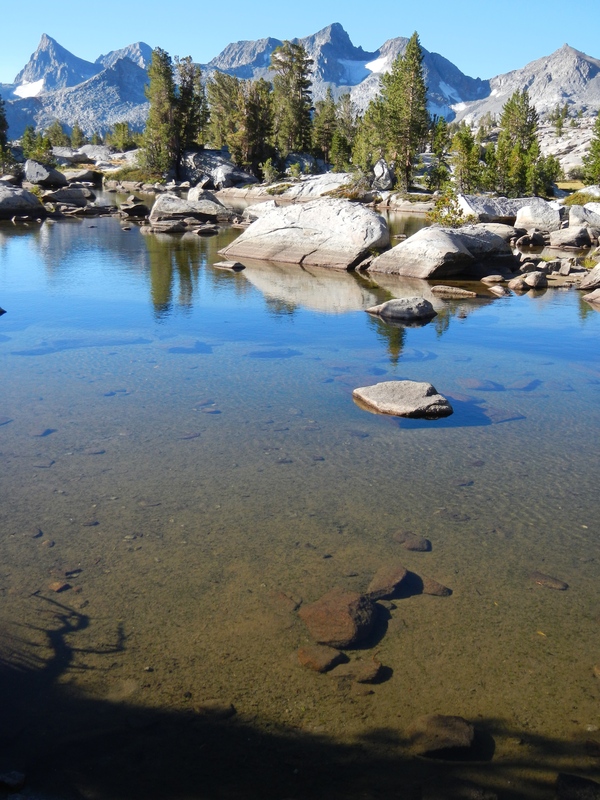 No sightings, but to my astonishment, one of them mentioned offhandedly, “You know, we’re not on the JMT here.” Dang! I grabbed my pack and went as fast as I could to try and catch her. I estimated that she could easily have an hour’s headstart on me by now. At first, I tried to just skirt the shore of Garnet Lake, only to realize that that lake is HUGE! 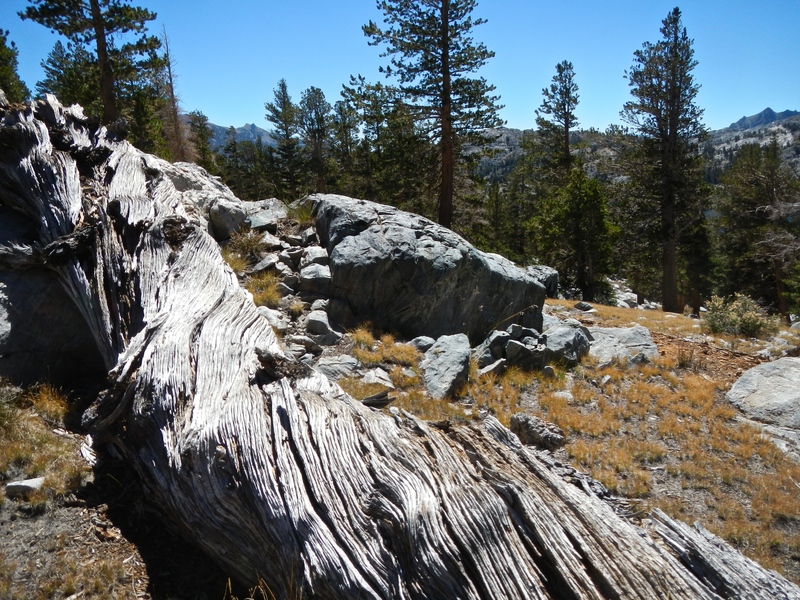 The only sure way back to the JMT was the steep mile-long grade we had descended to the lakeshore. I was imagining Betty pissed off that I had left her in the dust and wasn’t stopping to wait anywhere, which spurred me on faster. 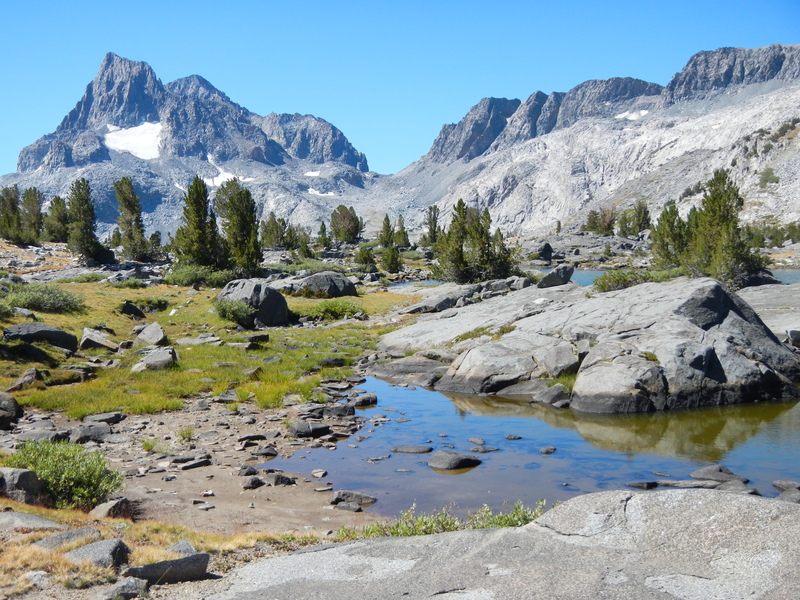 I got back up to the JMT, and continued mile after mile trying to catch Betty. I asked everyone I saw if they had seen her. The first group, 3 young women swimming in the lake, said that she had asked about me and was maybe 45 minutes or an hour ahead of me. Miles farther, the next guy said maybe 20 minutes ahead of me (almost no-one has watches on the trail, except of course Betty). The trail wound up and down through beauty of all sorts, but I was trying to catch her, going as fast as I could. No time for photos. Next people said 15 minutes. I was gaining on her. The last guys I saw (handsome Italians) said maybe 5 minutes ahead of me, but they had told her that they thought they had seen the woman she asked about (me) maybe 15 minutes ahead of her!!! All this time, about 4 and a half hours, I hardly stopped, except when I dropped my water bottle. I was running on fumes. Betty thought I was ahead of her and so was trying to catch me–as if I would be out of touch for hours on end! I finally caught her on a long uphill. To my surprise, she wasn’t mad at all, just still trying to catch me somewhere ahead of her. But I was totally fried! We agreed that from there on, we would meet up at every trail junction, should we be separated again. Now we’re camped at Rosalie Lake. I am drinking a little bit of Scotch to try and ease the day’s anxiety, and looking forward to seeing Tom tomorrow and to washing my clothes (white shirt especially–what was I thinking?) and taking a shower or two. I hiked today in my skirt, and found it very liberating. Today was about 15 miles for me, much of it at top speed. I kept imagining Betty being angry that I had left her so far behind (which I believe I would never have done). Relieved to find no anger, but a little miffed, I must say, to think that she would assume I would be such a lousy trail companion as to purposely be out of touch for hours on end. Oh, well. All’s well that ends well. I hope that guy’s brother is OK. I love trees, dead or alive. This one represents me at the end of Day 5. I hope that was not my smoked salmon that did not settle well? No, Gary. Your smoked salmon was delicious, and never made it to the trail. This was a commercial package. Yeah those old fashion snake bite kits can do wonders for the mind!!!!! Your photo of Thousand Island Lake is incredible! It was the salmon mousse. You’re right! I knew it sounded wrong in some way. I’m going to change it right now. Thank you! Stunning landscape, great stories. Glad to hear the nutcrackers are still in the mix.Thanks for sharing your beautiful journey. It’s inspiring to read this! Thanks Laurie! Very enjoyable to share in this. Pulling my gear together for a go. I’m sure glad that everything turned out alright! It could have been much worse had you twisted an ankle or pulled a muscle in your quest to catch up.